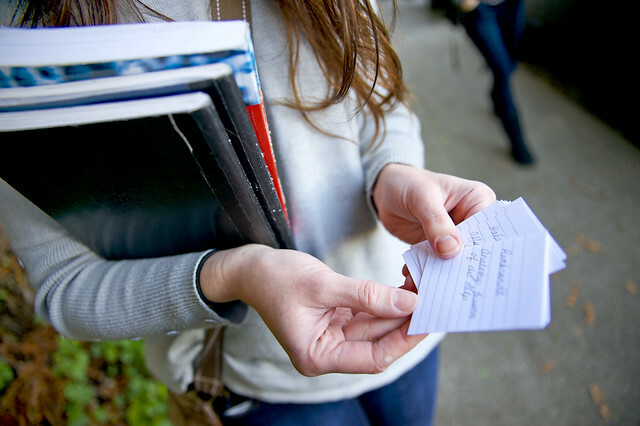 Flashcards are used all over the world by many students studying for exams. Here at ExamTime, we took the idea of an original Flashcard and re-vamped it. You can now make Flashcards online with our tool that is easier and more fun to use than your regular Flashcards! Flashcards are an easy way to memorize sets of related concepts. The key to memorization is repetition, and with a layout designed to be helpful and easy to use, you’ll have things memorized in no time! The idea with Flashcards is to reduce your need for repetition progressively, i.e. moving from daily review, to weekly and monthly in order to memorize the information over the long-term. This will be a big help when it comes to exams. No matter what you think about cramming, that method only puts the information in your short term memory so it’ll only be harder to recall in a testing atmosphere. Create Online Flashcards Here. It’s Free! There are thousands of online flashcards already ready to explore on our online library – take a look here. If you’ve read this far, you’re probably already more than convinced how important Flashcards are as a study tool. With all these benefits in mind, it’s time for you to make flashcards online yourself. ExamTime gives you the fastest, most simple and visual tools to create informative and creative flashcards for all your exam needs. What are you waiting for? Sign up now for free and begin your new learning journey. Improve learning by creating, sharing and discovering Online Flashcards with GoConqr.